Their offensive goal is to take at least 100 shots in a game, 12 to 15 seconds into the shot clock, with half from behind the 3-point line. In most situations they are robotic (do the same thing every time), but at a really fast pace. See Shooting - Grinnell 6-line. The basic quick-hitting set opens up the right side of the floor, letting the point guard penetrate, and sweeping through a shooter, using a triple (or double) screen. 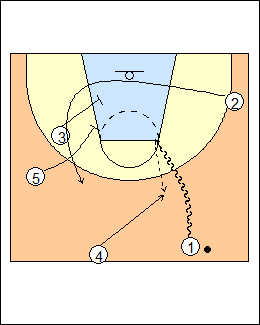 2 curls or fades, 4 slips to the basket if defenders switch the last screen. On a shot, the shooter rotates to the top of the key, the other four players rebound. 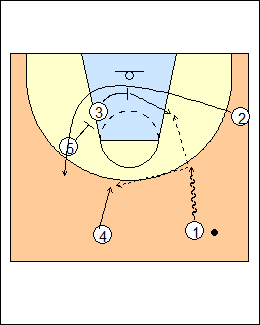 See Fast breaks - Old Dominion ("X"). The trailer can fill behind 1 for a pass. If a big defender zones up in the lane, spread the floor, take advantage of the attacker not being guarded, as a shooter or roving the arc as a free screener. 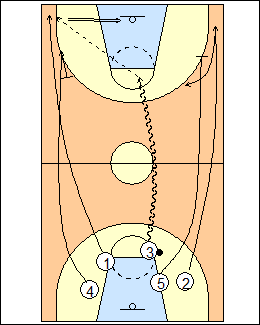 Two-man game - any time the defence forces the point guard to the outer third of the court, it's an automatic ballscreen by the trailer (roll or pop). 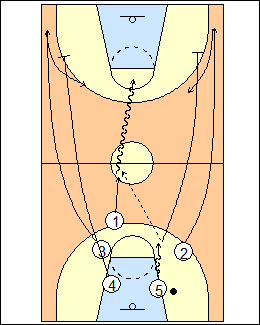 1997 book - if 1 dribble hand-offs to 2 coming off the double screen, 4 sets a second ballscreen, for 2. 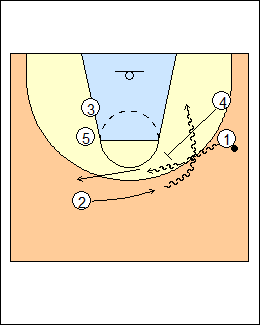 On a defensive rebound, the rebounder becomes the point guard until it's comfortable to get the ball to the point guard, from there they open up, players without the ball touch the sidelines at halfcourt, if possible open up the right side of the floor (see above), or hold in the corner if you sense that the point guard will be able to create a 3-on-2 for you (shown). Here 5 rebounds and gets the ball to 1, 4 and 5 pin down for 3 and 2 in the corners. Similar to a missed shot, whoever gets the ball becomes the point guard, passes to the point guard if it's convenient, everybody without the ball gets wide to the corners (open it up for the ballhandler), and defers to each other in terms of who gets the shot. 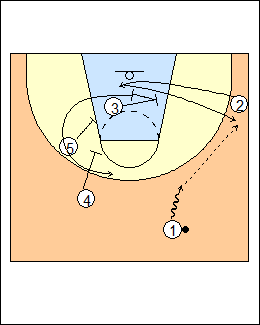 Here 3 gets a steal and pushes the ball, 5 pins down for 2 on one side while 4 backscreens for 1 on the other side. Coach can run a quick hitter for someone who has not been getting shots. 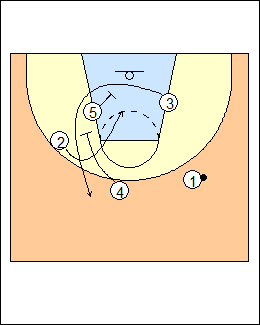 3-5-4 triple screen for 2, who fakes and circles back off a reverse screen by 3 (who then uses the double screen). 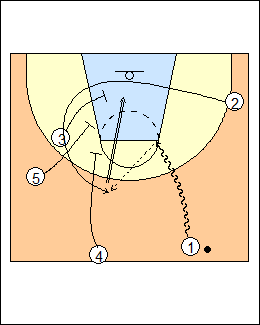 3 is guarded by a weaker player, sets the first screen for 2 then slip cuts to the low post. 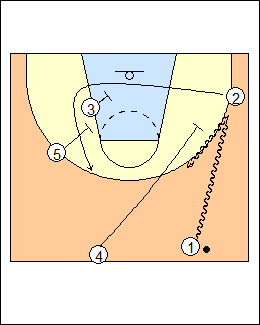 The best shooter inbounds (here 4) and gets a trail look. If there's no pass, 3 turns and uses a double screen to get open.